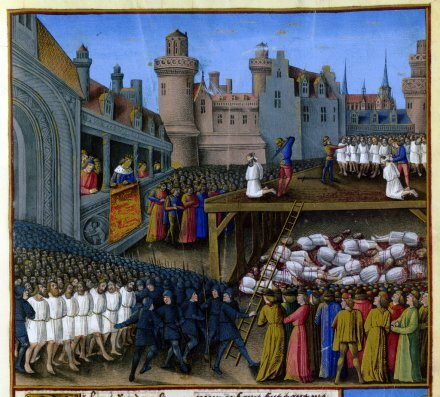 On this date in 1191, Richard the Lionheart had 2,700 Muslim prisoners of Acre demonstratively executed before his opposite number Saladin, when ransom arrangements dilated. From the 1st of August, 1191, to the 9th of October, 1192, King Richard remained alone in the East as chief of the crusade and defender of Christendom. He pertains, during that period, to the history of England, and no longer to that of France. We will, however, recall a few facts to show how fruitless, for the cause of Christendom in the East, was the prolongation of his stay and what strange deeds—at one time of savage barbarism, and at another of mad pride or fantastic knight-errantry—were united in him with noble instincts and the most heroic courage. 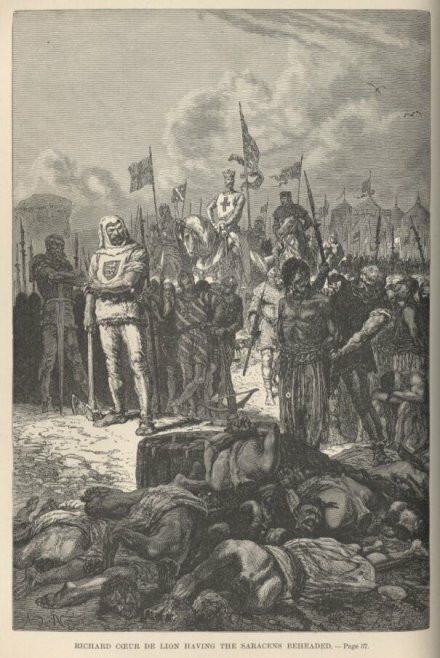 On the 20th of August, 1191, five weeks after the surrender of St. Jean d’Acre, he found that Saladin was not fulfilling with sufficient promptitude the conditions of capitulation, and, to bring him up to time, he ordered the decapitation, before the walls of the place, of, according to some, twenty-five hundred, and, according to others, five thousand, Mussulman prisoners remaining in his hands. Good thing that Jerusalem issue has since been cleared up. Exclusively available on this site: our one-of-a-kind custom playing card deck. Every card features a historical execution from England, France, Germany, or Russia!